Today’s Friday Five focus is Karen Carr, author of children’s and mystery short stories, novellas, novels, poetry. She’s a retired grandmother from North Iowa. Her grandchildren have provided lots of ideas for her children’s books. 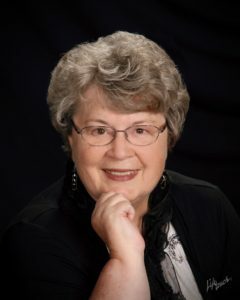 Now that she is retired, she likes to spend her time traveling to visit her children and grandchildren, and hopefully to go to author events while she is doing it. She is currently working on an 1860 historical novel centered in the Wild West. Her recent book is Mystery at Burr Oak: A Dog Named Wang. Wang is a hero when he solves the mystery in the story. She wrote this story to honor her mother, as she had a dog named Wang. I read all the time. I couldn’t get enough of reading. I read Mysteries, because I like to see if I can solve them before the end of the book. 3.What are some of your favorite words and why? Exacerbate. I just like to use it but have not found a place in any of my writing for it, yet. 4. What’s the worst job you’ve ever had and why? Nurses Aide. I worked the 11 to 7 shift and when I came home then I worked in the field on our family farm. I was always tired. Janette Oke. I like the style of the Old West and that is what I am patterning my current book on. Mystery at Burr Oak: A Dog Named Wang is currently available through Amazon.